The time has come to share some difficult news with you. After three and a half wonderful years as Debs & Errol, the two of us have made the very hard decision to part ways. We want you to know that this was not something we came to quickly or lightly. The band is very dear to us both and has been a central focus in our lives for a long time. It is sad and strange to imagine ourselves without it. But as people and as creators, we have evolved and grown and each of us must ultimately follow our own path. We feel so humbled and privileged to have shared this journey with all of you. Because of you, Debs & Errol is so much more than just music, so much more than just a geeky web comic. It’s a community of incredibly close-knit people who care about and support one another. This is still something that amazes us every day, and we know that the connections and friendships that we have formed together will not go away anytime soon. Other bands have told us that we have the very best fans in the world, and they are absolutely right. You have been amazing. You have been fantastic. You have cheered us on, suggested song titles to us and helped us create albums. You have dutifully read our webcomic, tweeted, commented, and shared us with your friends. You have been right there with us every step of the way, through the laughter and silliness, and also through a few tears. You have shared in our lives and let us into yours. For this, we are deeply, deeply grateful. We would like to thank Monkeyman Productions for starting us off, and the National Novel Writing Month and the filk communities, both of whom welcomed us into their midst right from the beginning. We are so proud, too, to have been part of the growing Geek Music scene in Canada. When we first started, we were just excited to find people like Nerds with Guitars who graciously let us perform with them. Since then, more talented bands have come into being and we’ve had the privilege to collaborate and share the stage with many of them. Seriously, there is amazing music out there and we can’t wait to see what the future holds. We both intend to continue on with creative things, so do keep up with us! First, we are going to hold a farewell celebration concert which will most likely be on March 7th. We hope to invite some of our musician friends and if they acquiesce, we hope they would be willing to perform with us and/or cover our songs. That would be awesome! 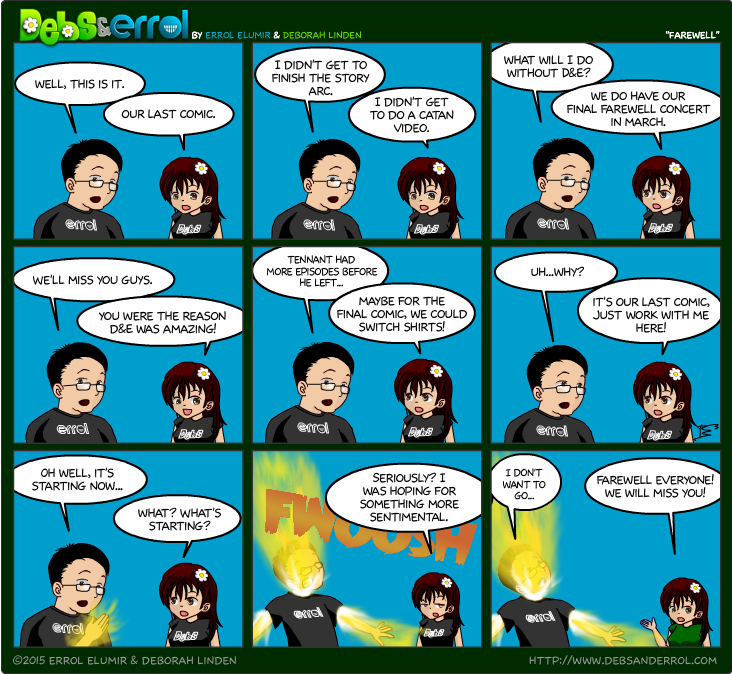 Errol is addicted to webcomicing, so please join him as he starts another daily webcomic. Who knows what it will be about. He doesn’t. Join him here, because he misses you guys. Debs will never be as prolific as Errol when it comes to social media, but she does have a Facebook page and a newsletter for her musical explorations. In closing, our most heartfelt thanks and gratitude to all of you. We’ll say it again: you are the best fans – and friends – a band could ever have. Take care of yourselves, and don’t be strangers. We’ll still be around on the internet! Especially Errol. He lives on there. Btw, will the D&E Puzzle Hunt still be available for play? What’s that they say about “all good things…”? This was a good thing. I am sad to see it go, but sometimes we have to move on to something else. I love you guys. That’s all I’m going to say. Aww. That is sad but you guys need to do what’s best for you. I know I’ll still see Errol around on social media and hopefully Debs will post an update every now and then. 🙂 But good luck in your future endeavors and I hope your last concert is a blast! Wish I could make it. And yet, I know this will also bring growth and new doors and opportunities for you both. So, happy face and smiles! Debs & Errol and Target in the same day?!? They say bad news comes in 3’s, so pardon me while I hide under my bed. That third item is sure to be a doozy. PS: Best of luck to you both! this makes us sad but understandable. Good luck in everything you do and continue to be geeky! So much sad, but also understanding and even some happy. I know this must have been the right decision for you guys, and that it was undoubtedly a difficult one to make. I’m beyond thrilled that Logan and I were able to see you guys in concert once before it was all over. You guys are amazing and talented and fun to be around. Hopefully we’ll have a chance to get to Toronto someday and visit you guys. Also, those last few panels…how could you? noooooooooooooooooooooo! i just found you guys! *sobs* this always happens! i need to stop finding awesome things so that those things continue being awesome. but for reals, i’m glad i got to find out about you while you were still debs and errol. i’m sad, though, that i live in texas and have zero chance now of ever seeing you live. but you gotta do what you gotta do! all the best to you two nerds! and of course i’ll be following errol’s new comic! i’m a comic addict! Well, I for one was beginning to wonder when January came around and the hiatus continued. I’m going to miss this. Sadness 🙁 but this is the best ending to your comic that you could have done! Good thing I brought an extra hankie today. :'( Will miss you guys bunches! The day I go do my monthly Twitter and D&E check (I’m bad with webcomics and social media, shoosh) is the day I’m faced with this heartbreak. I wish you guys both all the best! you just had to scheduled your last concert the day after my birthday. didn’t you? 😛 Anyway, I’m going to miss D&E songs and I only ever got to see one concert so I’m kinda sad about that but best of luck to the both of you in the future. P.S. errol now that you have more time I expect you to play teraria 1.3 with us once it comes out 😛 . I will miss you. You're both amazing.